For twenty five years, MassTrac customers have had a competitive advantage when it comes to influencing the Massachusetts State House. We offer the tools necessary to add context and clarity to the legislative process. 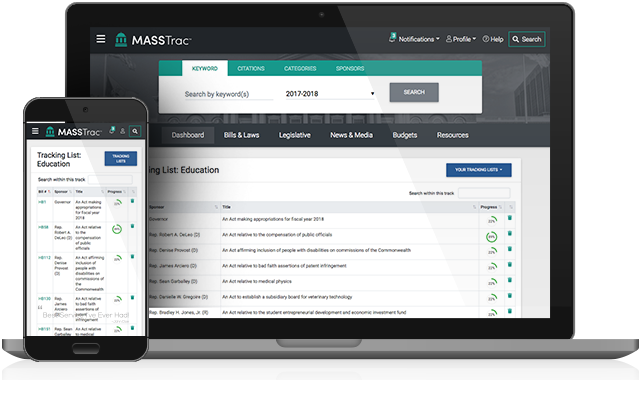 With easy to read bill summaries, unlimited tracking and alerts, reports on hearing testimony and collaboration tools, MassTrac meets the needs of legislative professionals. Summaries of bills and budget amendments prepared by a team of long time legislative staffers and attorneys. Simplifed, easy to read vote descriptions. Changes between bill versions are highlighted for easy review. Compare changes to inside and outside language budgets. 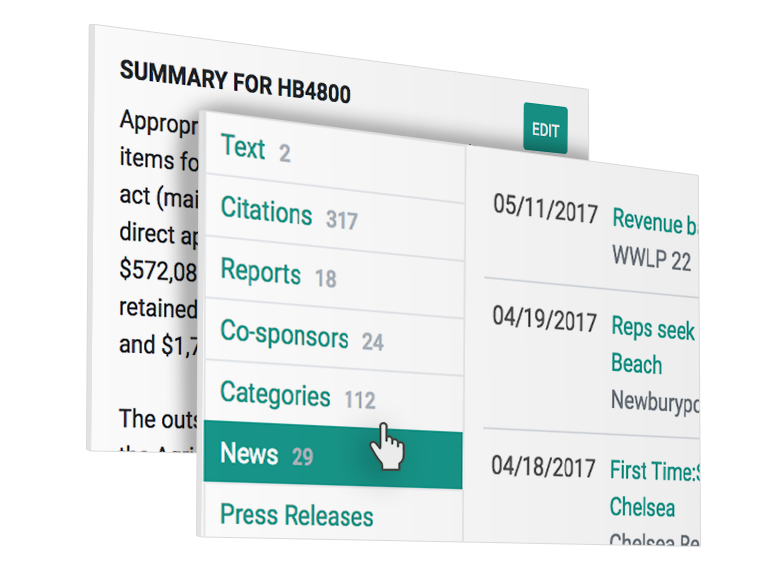 Easily access all related bill information including news, press releases, research papers, hearing testimonies, and similar bills from other states. Follow as many bills as you want and get close to real-time alerts on bill actions. Read digests of prior-day legislative events. 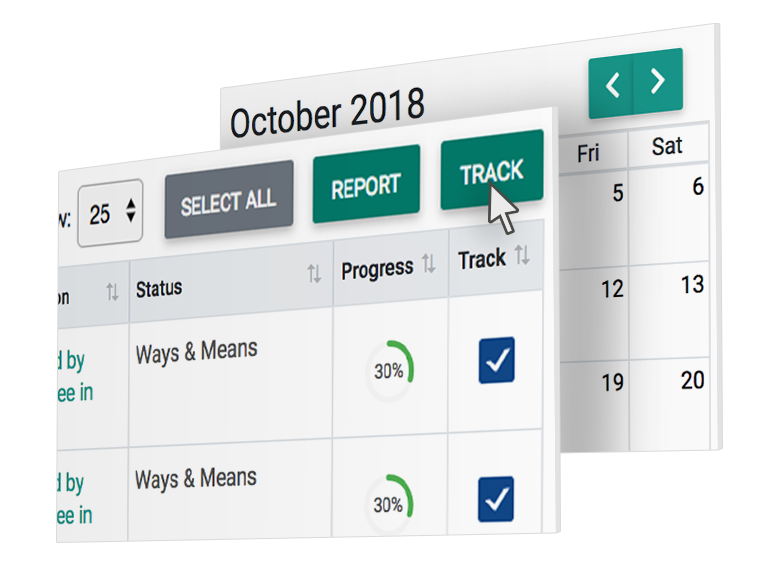 Collaborate on bills, track committee and chamber support and sync legislative calendars with your personal calendars. View amendments, outside section summaries, consolidated amendments unbundled and line item changes. Track and follow bills by client. Manage hundreds, even thousands, of bills. Generate client reports, save them for future use – they automatically update. Receive notifications of potential changes to governing statutes, or impacts to your municipality. Follow budgets and track line items - between gubernatorial, House & Senate versions. See line item changes over time. Easily monitor legislation for clients. Access the quickest source of proposed and actual changes to laws. Conduct historical research on statute change. Your best bet for determining legislative intent and history. Expand your government affairs reach. Receive advance notice of hearings. Keep your members, legislative and executive committees informed. Effortlessy keep members informed. Create advocacy pages on your site with InstaTrac Web Publishing. Create legislative scorecards based on how you’d like legislators to have voted. Discover which legislators are most aligned with your goals. Use our new grassroots advocacy too! Stay ahead of the curve by identifying potential legislative threats and opportunities early. Manage the process from wherever you are - whether it's Boston or Boise. Bring your bills, positions, and comments to the attention of your stakeholders from web pages that we build for you. Customized page design branded to match your own site. MassTrac Grassroots Advocacy provides the ability to keep members engaged by making it easy for them to participate. Reports show who participated, wants more information, or opted out. Customized reports for political campaigns from single issues to career voting records. Staff attorneys set up your accounts and draft or review bill text for you. Sign up to receive the day's curated top stories, legislative schedule, press releases, and more. Ready to get started? For pricing and more information about MassTrac or other services we offer, send us a message. Or, call us during normal business hours at 617-292-1800. For twenty five years, InstaTrac customers have had a competitive advantage when it comes to influencing the Massachusetts State House. We offer MassTrac, our flagship service, and other tools necessary to add context and clarity on the legislative process.